Martha Zierden and her colleagues at The Charleston Museum provide one of the best detailed examination of free persons of color, primarily for Charleston's "East Side." While the discussions provide a range of carefully collected data demonstrating that the gulf existed, there is relatively little cultural interpretation of how this gulf may have affected African-American society or how the differences may have be perceived in the archaeological record. The Charleston Museum's East Side study also reveals the intensity of the geographic concentrations of free persons of color. Low rents and the ability to build houses of wood on the Neck (outside the regulation of the City) are offered as reasons that free blacks gravitated toward the area. While free persons of color, urban slaves, white immigrants, and wealthy planters or merchants all lived in the same neighborhoods, there was clustering of these different groups. The wealthy individuals were typically found on the wider, major thoroughfares, with the slaves and free blacks living on the back streets, alleys, and dead end courts. There has only been one opportunity to explore free persons of color in downtown Charleston. In 1996, with the construction of the Saks Fifth Avenue store on the block bounded by Market, Archdale, Princess, and King streets, historic research revealed the presence of several lots typically occupied by free blacks during the early nineteenth century. For example, 161, 163, and 165 Market Street (then known as 99 through 144 Market) were owned before the Civil War by Robert W. Seymour and were rented to free persons of color. Two of the known occupants were Jane Thomas and Ann Graves. On the corner of Market and Archdale streets was a grocery, saloon, and pool hall owned by C.H. Klenke, a white merchant. The Beach Company provided funds to allow some archaeological study before the Saks store was built. This work, conducted by Chicora Foundation and reported in the book, The Other Side of Charleston: Archaeological Survey of the Saks Fifth Avenue Location, Charleston, South Carolina, provides some important clues on how free blacks lived in antebellum Charleston. The archaeological research began with the premise that the material culture would be relatively poor. This was found not to be the case. 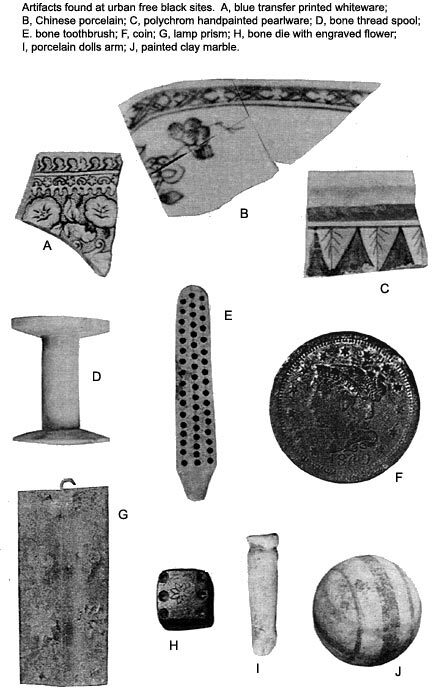 The types and proportions of the different artifacts found in the archaeological study were strikingly similar to what are recovered at the residences of white planters and merchants. The only real differences, based on this initial study, is that free blacks either did not have as much access to tobacco products, or chose not to use them, and that weapon use or ownership was less common among free blacks than among white planters. Otherwise, free blacks appear to have been intentionally working to integrate themselves into mainstream Charleston society. When the ceramics - the plates, cups, bowls, and serving dishes - of free blacks are examined, it becomes clear that they couldn't afford the same fancy items used by white families. Nevertheless, the crockery used by free blacks was a lot more elegant than that used by the neighboring saloons or by urban slaves. This finding also suggests that at least these free persons of color were gradually acquiring better and finer ceramics. For example, the archaeological research reveals a clear preference for the more expensive painted and printed wares, while relatively few of the edged and annular wares, common at slave houses, were found. Another telling discovery was that the free blacks owned a number of table glass items - tumblers, wine glasses, and similar fancy items not found at slave sites, or even among many white laborer families. The ceramics also give us a good hint that the free blacks initially maintained their cultural ties. We know that at virtually every slave site studied, bowl forms dominate the collection, probably because slaves had to rely on so-called "one-pot meals." The types of stews and gumbos eaten out of bowls are also closely tied to African foodways. At the free persons of color site, we found a similar reliance on bowls, with relatively few plate forms being present early on. This suggests that their dietary pattern still emphasized one-pot meals. But the collection also reveals that this pattern changed over time. Plate forms increase over time from about 29% of all the vessels present to as high as 65%. This probably indicates that the free persons of color living on this site were working to integrate themselves into Charleston society - to be more like white families. Other items at the site also help us to understand how these free blacks might have lived. For example, the presence of slate pencil fragments emphasizes the importance of education in the black community. A fragment of a carpenter's pencil may reveal the trade of at least one of the occupants. The presence of a brass furniture tack suggests the accumulation of nice furniture. Fittings and glass shades from kerosene lamps indicates an effort to outfit the house for comfort. The buttons recovered indicate a mix of nicer goods along with more utilitarian, or work, clothing. Other clothing items include brass hooks and eyes, from women's gowns. Several heavily worn coins were also recovered. Coins are often found at black sites and may reflect deeply rooted West African traditions. Even the animal bones found at the site help tell us about these free blacks. The faunal [animal] collections produced high frequencies of cranial and foot bones, probably because the blacks were butchering animals in the backyards. This wasn't uncommon in Charleston, especially among those wealthy enough to raise or purchase a heifer or sheep. It assured fresh meat and would have been less expensive than purchasing cut meat from a butcher. But the remains from Archdale Street also revealed a number of meaty cuts, suggestive of an upwardly mobile family. They weren't just relying on the less expensive cuts and selling the better cuts - they were eating virtually the entire slaughtered animal.